You may already be familiar with Mr Hare and his wonderful shoes, but I suspect a greater number will not. So, I thought this an ideal place to highlight one of the UK’s newest and most talented shoes designers. Of Jamaican descent, an Arsenal supporter and London based, I had the pleasure of meeting Mr Hare at London Fashion Week. A chap on a mission, he describes himself as “Just a man with a passion for shoes who feels let down by a shoe industry that doesn’t really seem to care”. 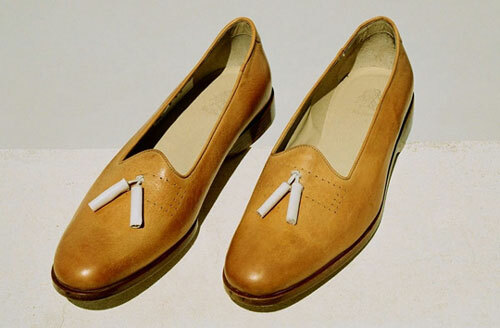 As to his designs, his website carries the description “shoes you can attach some romance to”. Shoes are named after various heroes – this season its authors – and it seems to work. The Mr. Fitzgerald, for example, leaps straight from the pages of ‘The Great Gatsby’. He plays with texture and material in a way that manages to be both elegant and striking . 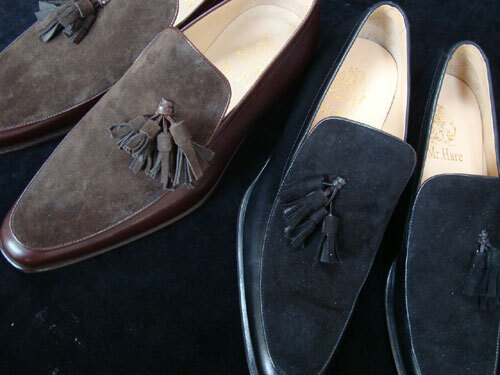 For example, my favourite shoe – the Mr Genet – combines leather, suede and velvet. While being highly original, all his shoes have a classic resonance which makes them easily recognisable. It also makes them easy to incorporate into a classic wardrobe. Mr Hare is quite picky about who stocks his shoes, and is equally particular about their manufacture. Aside from the high quality materials all his shoes are handmade in Italy and blake constructed. They’re not cheap, but a fair price in my view. Despite being a prolific blogger he remains a strangely elusive character. In none of his interviews will you find mention of his first name –I’m not going to spill the beans. Indeed, if all you knew of him was his shoes and his blog you might think he was a rather extravagant, even theatrical, man. The reality is that he is a softly spoken, polite and down to earth man who clearly enjoys his relative anonymity. In many ways this lack of flashy self publicity adds to the allure – let the shoes do the talking I say. Subtlety of detail, elegant originality and high quality construction, the talented Mr Hare is someone you’d do well to become acquainted with. whats the prob with Mr hare? Ain’t we got decent shoes in the UK? as for being a Gunner then stuff yer shoes dude!!!! This design has been traditionally used in Sudan for ages now. Their design only lacks the refinement of today’s styles in touches.